Fishing here in Fort Lauderdale aboard the Happy Day Today with the Topshotfishing team, Tim Eastwood and friend, Jim, from MI chartered us to do some Sailfishing. A breeze was out of the west, northwest, 12-15 mph, current going to the north at 2 knots and a defined color change sitting in 165 ft. of water off of Fort Lauderdale FL – a perfect avenue for fish to follow. We stopped to pick up a dozen live Goggle eyes from T&T Bait. From there we headed straight out. We put two kites out, two Goggle Eyes from each kite and one Goggle Eye down deep. Our first bite came from the left, long kite, which was a 12 lb. Mahi Mahi, followed by a couple of Bonitos. Then — Sailfish left short!!!! He made his appearance as he circled the live Goggle Eye, bill out of the water, with intent to eat the bait. The line screaming off the reel, as he tail-walked away from the boat, with sun gleaming down on his blue and silver neon body. Twenty-five minutes later, the Sailfish was brought to the side of the boat by Tim, as our mate, Jackson, leaned over the side and grabbed the bill for picture taking. 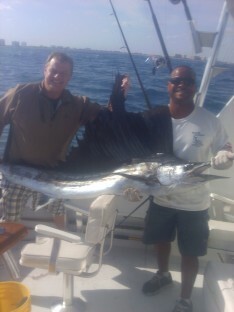 The Sailfish measured out to be 97” long. We released the fish and Tim decided to do a replica mount. With a couple more Mahi Mahi’s in the fish box in the 6-10 lb. class, it was time to head back to Fort Lauderdale FL aboard the Happy Day Today.